(Phys.org)—An international team of researchers has run multiple global climate computer simulations multiple times and has used the simulation results to estimate the local impact of rising sea levels on coastal cities around the globe. In their paper published in Proceedings of the National Academy of Sciences, the group outlines the first serious attempt to account for multiple factors in making predictions about sea level rise amounts around the world. 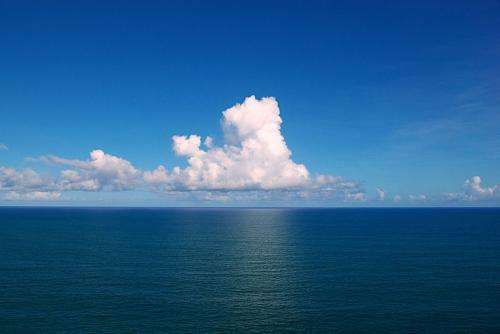 Contrary to what might seem obvious, sea levels do not rise in a uniform manner—levels may rise more in parts of Asia, for example, than along the California coast. These differences are due to factors such as ocean currents and the location of melting ice. Thus, as the planet heats up and more ice melts, resulting in higher sea levels, some coastal areas will see higher levels than others. In this new effort, the researchers sought to predict how much rise individual coastal cities are likely to experience as global temperatures reach two landmarks—2 °C and 5 °C higher than pre-industrial levels. To make their estimations, the researchers ran approximately 24 computer simulations approximately 5000 times—the models accounted for such factors as temperature rise of the air and ocean, ocean currents and the impact of melting ice. The models offered results very similar to those previously made by other researchers regarding global sea rising amounts, but they also offered estimates locally, showing, for example, that many parts of South and South East Asia are likely to see higher rises than other parts of the world. They also showed that the more levels rise, the faster the rise becomes if the factors contributing to global warming are not changed. If things continue on their current path, the researchers suggest, global temperatures are likely to become 2 °C higher than pre-industrial levels by 2040 or 2050 and 5 °C higher by 2100. If these milestones are reached, the simulations suggest, the Earth would experience a global sea rise of approximately six inches by mid-century and two feet by the end of the century. If that happened, the models suggest the East Coast of the U.S. would experience a sea rise of a foot by mid-century and cities like Lagos, Manilla and Ho Chi Minh City would experience a rise as much as three feet by the end of the century; New York City could see a rise of more than three and a half feet. Two degrees of global warming above the preindustrial level is widely suggested as an appropriate threshold beyond which climate change risks become unacceptably high. This "2 °C" threshold is likely to be reached between 2040 and 2050 for both Representative Concentration Pathway (RCP) 8.5 and 4.5. Resulting sea level rises will not be globally uniform, due to ocean dynamical processes and changes in gravity associated with water mass redistribution. Here we provide probabilistic sea level rise projections for the global coastline with warming above the 2 °C goal. By 2040, with a 2 °C warming under the RCP8.5 scenario, more than 90% of coastal areas will experience sea level rise exceeding the global estimate of 0.2 m, with up to 0.4 m expected along the Atlantic coast of North America and Norway. With a 5 °C rise by 2100, sea level will rise rapidly, reaching 0.9 m (median), and 80% of the coastline will exceed the global sea level rise at the 95th percentile upper limit of 1.8 m. Under RCP8.5, by 2100, New York may expect rises of 1.09 m, Guangzhou may expect rises of 0.91 m, and Lagos may expect rises of 0.90 m, with the 95th percentile upper limit of 2.24 m, 1.93 m, and 1.92 m, respectively. The coastal communities of rapidly expanding cities in the developing world, and vulnerable tropical coastal ecosystems, will have a very limited time after midcentury to adapt to sea level rises unprecedented since the dawn of the Bronze Age. Strange. Predictions early when Global Warming was first 'discovered' stated that our coastlines would be several feet underwater by now. Apocalyptic eco-disasters are always 10-20 years away and always require massive government intervention, massive transfers of wealth and a much lower standard of living to prevent. But when the time for the predicted eco-disaster rolls around and nothing happens that prediction goes into the memory hole never to be mentioned again. A broken clock is correct twice a day. It seems eco-doomsayers don't even have that level of accuracy. Functionally the Arctic sea-ice is gone but not quite yet if physical measures are taken, emission reductions can't save it too slow because they deal with a limited amount of heat versus heat-sources. With today's albedo-loss it's worth 25-years of USA power compared to the 1980-2010 sea-ice cover, about 3,800-TeraJoule-hours/yr for USA power = 95,000-Twh a year in energy, 1-Watt = 1-Joule. Global steam waste-heat is aout 36,000-Twh/year of directly heating the planet; comparing them: 36000 ÷ 95000 = 38% of albedo-loss for impacts. We have direct control over this waste-heat and need to end the Steam Age the waste-heat and CO2 are like nuclear waste, eh? So, the incentive is to not double this "heat source" of the Arctic water gaining that much a year, 95,000-Twh is a lot to counter by dropping emissions when 25% of what's emitted now remains over 10,000-years. So Saddam Hussein didn't use WMDs on the Kurds and Iranians? Strange. Predictions early when Global Warming was first 'discovered' stated that our coastlines would be several feet underwater by now. Can you provide a reputable link to any of these predictions? If you can't some may think that you're just making these things up and that you're just a sick troll. Repeating this, as it needs to be said. tblakely's original post is incorrect; the vast bulk of the scientific projections for sea level rise were always for 2050-2100, or originally, even further out. Sigh. Projections based on computer simulations are wrong. The models do not accurately mimic natural processes so their results are inaccurate. It is exceedingly difficult (likely impossible) to model global climate. "It is now pretty clearly agreed that the CO₂ content will rise 25% by 2000. This could increase the average temperature near the earth's surface by 7 degrees Fahrenheit. This in turn could raise the level of the sea by 10 feet. Goodbye New York. Goodbye Washington, for that matter." Back in March, James Hansen predicted sea-level rise of "several meters over a timescale of 50–150 years". FYI, at current rates global sea level will rise 0.08 to 0.23 meters over 50-150 years. As you say Moynihan was no scientist, and what makes you think that current rates of global sea level change are going to remain the same? Your clutching at straws a bit here. Let me get this straight. 2C by 2050 after 350 years including rising from the little ice age which may be more than half of the gain. But then in the next 50 years we will get 3C ? That's 0.6C / decade when temperatures have been going up 0.05C/decade for a century with no acceleration but after 2050 temperature will accelerate 12 times faster!!!! Why? CO2 acts logarithmically. What that means is that every CO2 molecule produces less and less change. So, given the unlikelihood of using exponentially more carbon fuel supplies after 2050 they predict 12 times as much CO2 output or more. Do you get why people think this is a hoax? These assumptions are absurd. There is ZERO ZERO POINT ZERO CHANCE of this happening. This story is crap. We won't get 2 feet this century. No way. When Trump says this is a hoax these are the kinds of articles that PROVE him right. How can temperatures rise 3C between 2050 and 2100? THERE IS NO BASIS FOR THIS. We have gotten 0.5C in the last 70 years. People keep saying temperatures are going up but they are going up very slowly compared to what they predicted and this is PROOF. They are trying to play catchup. We get 2C they claim (which we won't get even 1.5C in reality) by 2050 then temperatures accelerate by a factor of 12 to 2100. Really? This is SCAM SCIENCE. This article is proof of that. aksdad, you are so right. This is hype beyond hype. The kind of insanity we've seen in this campaign over and over with the brainwashing repetitive messages of liberals that has deluded so many americans with believing they would win this election. They repeat and keep making scare claims over and over and dumb people believe this crap who never look at the absurdity of the math. They never look back at all the failures of the science. Over and over the projections and predictions have failed by huge amounts. Virtually nothing they said would happen has even gone in the same direction.